Halloween 2018 – Academy Classes & Trick or Treat Safe Zone! Bishop’s 5K 2017 – Congratulations! See Holy Week Schedule for April 18th thru April 21st. Every Year Can Be A Year of Mercy! Even though Pope Francis declared December 8th, 2015 – November 20th, 2016 to be the Year of Mercy. This year, 2017, can also be a Year of Mercy! In fact, every year can be the year we choose to exercise mercy to the members of our family as well as to the neighbors and the strangers we encounter in our daily lives. Showing Mercy is an ongoing choice we choose to make in our lives! How can we embrace Jesus’ Mercy for us? By experiencing it personally and learning about it! By accepting His Forgiveness in the Sacrament of Reconciliation. 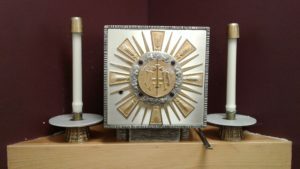 By attending Adoration (every Tuesday from 9 am to 9 pm in the St. Ann Chapel, for minutes or hours), by praying the Chaplet of Divine Mercy (every Friday at 3:00 pm in St. Ann Chapel). By reading books and pamphlets (33 Days to Merciful Love, A Do It Yourself Retreat in Preparation for Consecration to Divine Mercy by Father Gaitley). How can we share His Mercy with others? Jesus told St. Faustina that He was giving her three ways to exercise mercy: by deed, by word, and by prayer. Choose one of the three ways to focus on each day. Exercising mercy can become a habitual and characteristic practice for you. You can choose to smile! St. Teresa of Calcutta said, “Every time you smile at someone, it is an action of love, a gift to that person, a beautiful thing.” Every day, let us to choose to show love and mercy to everyone we meet. Remember whatever you did for the least of your brothers and sisters, you did for Jesus. The Bishops encourage all Catholics to consider offering up the day’s inconveniences and performing an act of charity. The Corporal and Spiritual Works of Mercy as well as the Beatitudes would be an excellent place to start for getting ideas.